If you’ve just washed your hair, or been to the hairdresser, that’s the day the wind will blow like crazy. Then you’re faced with this huge decision: wear a hat and risk hat head on your new “do,” or go without, and let the wind give you a decidedly windblown coif. I guess you’ve figured out it’s really a no-win kind of thing. 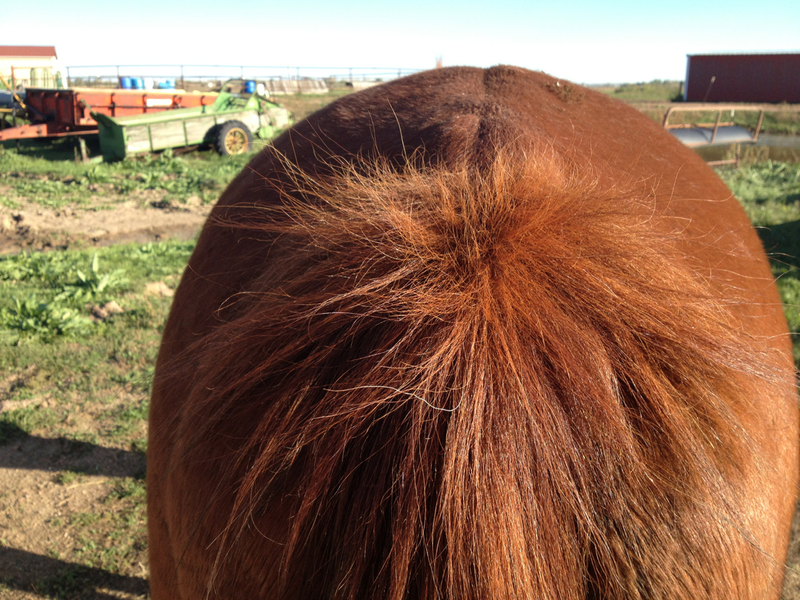 One might think I’d learn to wash my hair after going out to feed. And if you think this dilemma is restricted to humans, think again. The wind was recently playing havoc with the Golden Girls. Made their tails look like nothing but split ends. It’s been a challenging summer with heat, rain and wind. Maybe it’s time for a spa day. If March comes in like a lion, she’ll go out as a lamb. Well this year, March definitely made her appearance as a lion. It seems the wind whips across the pasture with greater force than in town – all that wide- open space, I guess. 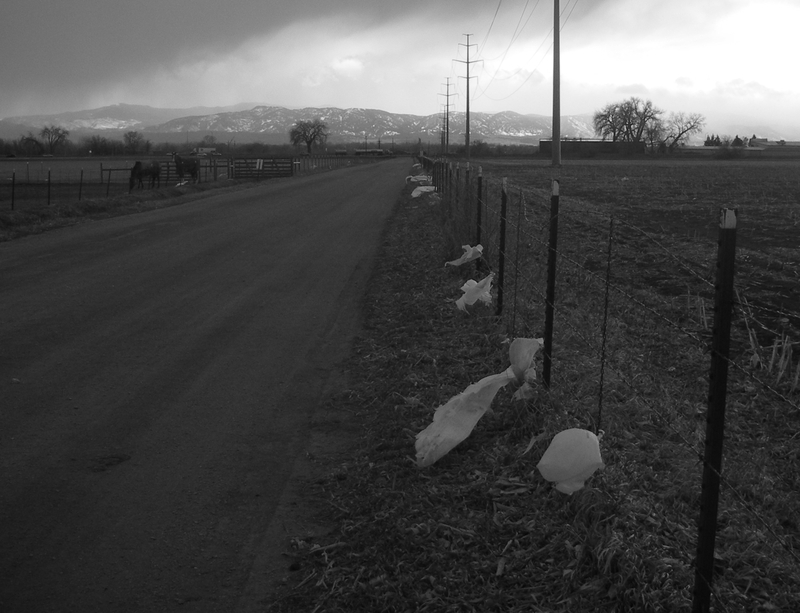 I knew it was going to be nasty out there, because when I turned down the lane, I was greeted by shrouds of white caught on the fence and flying parallel with the ground. They’ve been trapped there since mid-winter when another ferocious wind set them loose from wherever they’d lived previously. Charles Dickens and his ghosts of Christmas present, past and future crossed my mind as I made my way toward my two old sweeties. By March I’m sick of the wind. We haven’t had much snow this winter. Nor has it been all that cold. Not like it could have been, though I also acknowledge that here in northern Colorado, winter isn’t quite finished with us. March is often our snowiest month. I think I’d gladly take more snow, if it could come without the wind. My eyes sting, my skin feels gritty, and my attitude goes to hell in a hand basket when I’m battling the wind. You’d think having grown up in Wyoming, I’d take wind in my stride. Maybe I did at one time. But as I’ve gotten older, my tolerance for wind has diminished. I could do nicely with much less of it. A week or so ago we had some really big wind blow through our community. On our way to the horses we saw a huge evergreen tree toppled over, it’s shallow root system encircling the tree like a dirt-colored Frisbee. In the backyard common area we share, an old cottonwood split in half – one side crashing to the ground. And the oddest thing to me, or perhaps the most interesting was that the wind literally peeled the paint from our garden shed door. I found strips of it littering the street when I walked to get the mail. Now that’s some serious wind! As for the horses, they mainly hung out in the shed, sheltered from the wind. 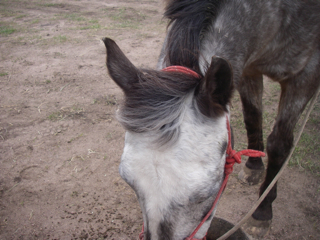 But Brio, the youngster of the herd seemed to revel in his mane blowing, his forelock taking on the windswept look. Where do you stand on wind? And if that’s not challenging enough, we mustn’t forget the whole money thing. 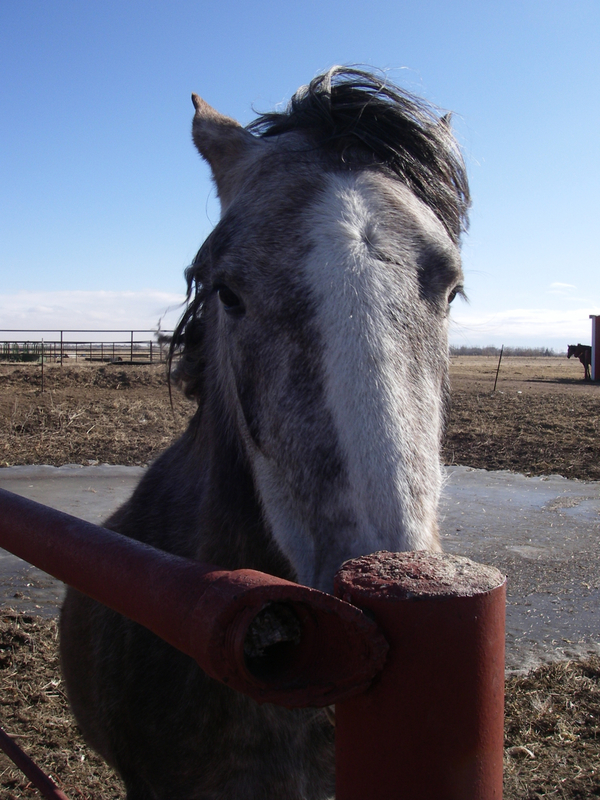 If you think renovating a house can be a money pit, try keeping horses. Actually it’s a lot like having children. There’s always something else to do or get for them that you know is going to score a direct hit to your bank account. I’m going to let you in on a secret – a peek behind the curtain so to speak, to understand some of the lesser-known perils. These are so little known, I’m pretty sure you’ve never heard of them, unless you’ve been with me at a party when wine or mojitos or margaritas were on the menu. And I’ll warn you in advance that I’m going to mention underwear and bodily functions. In case any of you are squeamish about these topics, you may want to stop reading right now. It was one of those days back at the tail end of winter, before spring was even a glimmer in anyone’s mind. The pasture was frigid and windy. I mean really windy. The folks delivering hay would deposit it in little piles around the pasture, so that everyone in the assorted mini-herds could get their share. In theory it was a great idea. But in practice, it was a different thing entirely. The wind was the downfall of this brilliant feeding idea. 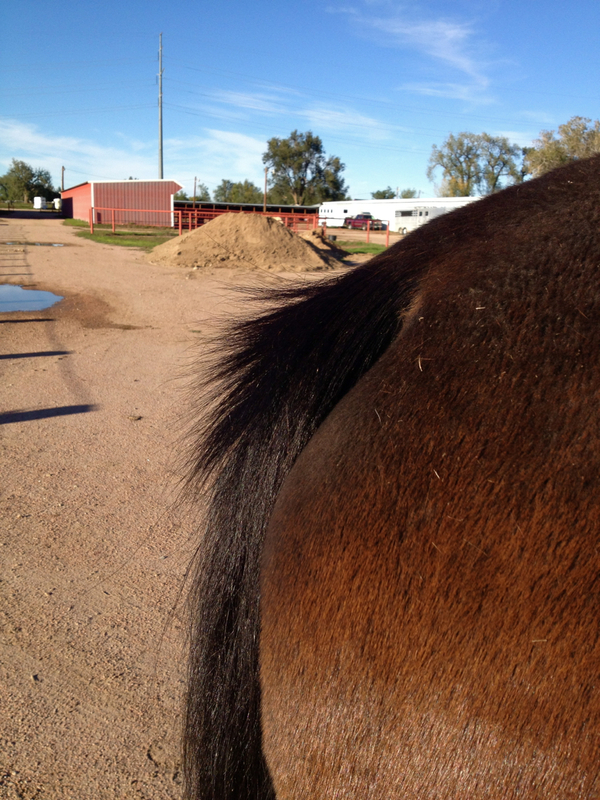 In winter the horses get hay twice a day – morning and night. And then I go out around noon to supplement our two old sweeties with grain. So I was doing my thing, and complaining soundly about the wind, when I noticed most of the luscious, green hay had blown out of the fence and into the other pasture away from the horses. Being the worrier and quasi-Jewish mother type (no offense to all of the real and wonderful Jewish mothers), I worried that the horses were hungry. I took it upon myself to gather up the hay and toss it across the fence. I would toss and Mother Nature would toss right back. Hay in; hay out. In and out in and out. Sometimes I’d hold a handful up so one of the horses could eat. They seemed grateful. Though they could have just been amused at the drama unfolding before them. What else was there to do on a cold and windy day? And I suspect they find me quite amusing. Bud and Peppr finished eating and I loaded up and headed for home. That’s when I noticed something scratching me, under my bra. I tried to reach in and remove whatever was causing the problem. But I was strapped into my seat belt and wearing my heavy duty Carhart barn coat. And I was driving. In other words, that plan wasn’t working so well. As soon as I got home, I pulled off my clothes. And there, inside BOTH cups of my bra was LOTS of dried hay, crushed up and scratchy. Now, be honest. 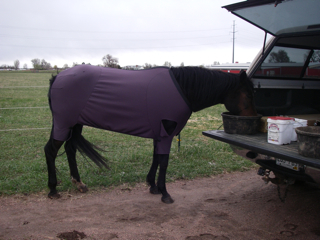 You’ve never been warned about hay in the bra as a peril of horse keeping have you? I can guarantee it isn’t in any of the horse books I’ve read. P.S. Don’t worry Bud and Pepper. 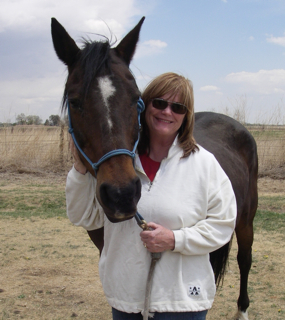 As far as I’m concerned, the benefits of horse keeping FAR outweigh the perils. The two of you are in my list of top ten best things in my life. That is if I actually had such a list. P.P.S. Tomorrow I’ll tell you the second peril. Stay tuned! I was having an animated discussion the other day with Mother Nature – the Colorado Division. Actually, animated is the sanitized way of saying I was screaming into the wind. Okay, maybe I was swearing. This was happening as I tried to get the hood of my Carhart jacket to stay on my head. It wasn’t working so well. I hadn’t brought a hat, and my head, along with the rest of me, was cold. Freezing. Who thinks they need a winter hat in May? I knew it was cold when Pepper started shivering. It had been raining and the combination of wet and wind was doing a number on my skinny girl. We were both freezing our #$%^-es off. I was in less danger of that happening than Pepper, but you get the picture. It’s a figure of speech. I pulled Pepper’s lightweight blanket, which looks like a pair of children’s stretchy pajamas, from the back of the car and covered her. She was stylin’ and warmer, I hoped. At least she stopped shaking. The wind was relentless, the sky dark and threatening more rain. Mother Nature didn’t say a word. Her reply was to send a blast of wind into my face, knocking my hood off. Did I mention that I had dirt glued to my lips, embedded in the lip balm I’d just applied? Another little gift from M.N. 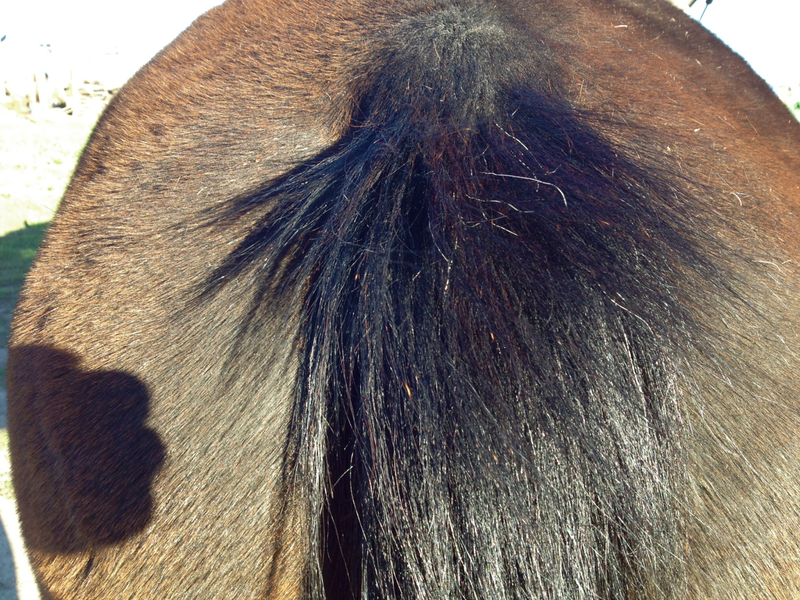 Horses know to put their butts into the wind, but on this day it was tricky, because the direction of the wind kept shifting. You can see Bud’s hair standing up as he was eating. That’s wind, not mousse, giving him the comb over look. I knew I sounded like a spoiled child, but I couldn’t seem to stop the wailing, the moaning, the complaining. Maybe all that emoting was helping me stay warm. That’s when I started to look around and really see. The pasture was the most gorgeous emerald green, and there were little purple flowers blooming along the road. As I drove into town I saw tulips and daffodils everywhere. It was an explosion of color. And, the fruit trees. Oh, my gosh! They’ve never been more stunning. The blossoms on the plum and cherry and crab apple trees are thick, fat balls of blooms. Gardens are coming back to life, as are the people who tend them. In the background, I could hear Mother Nature. Like a magician about to pull back her cape and reveal something amazing, she whispered to me.